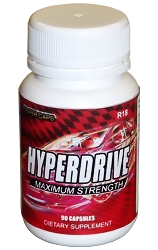 HyperDrive is a great product formulated for maximum acceleration and minimum slow down. HyperDrive is a great all round energy formula that improves energy and uplifts mood. Suitable to take daily to manage weight, or just when extra energy is required at the gym or at a party. It is a perfect legal substitute to amphetamine, ideal for any night out. With no bad comedown or adverse side effects. Each capsule contains: Citrus Aurantium, Green Tea, Piperine. Each bottle contains 90 capsules. Dosage: The usual dose is 1 – 3 capsules and will last 3 hours, and result in greatly increased energy levels. You may take an additional dose when you feel the initial dose wearing off. If you suffer any health problems or are on medications check with your doctor first.